Uraan Andersson Suruí, the speaker of the Audio Contact with White Man, foto: Ellen Slegers, 2014. As a participant of the project of the Latin American pavilion of the 56. Biennial of Venice, you have chosen an extract of the mythological story Amo Anar Segah of the Paiter Suruí. What motivated you to chose this text? Considering it’s meaning, this text enables the listener to hear the ancestors of the Paiter Suruí Indians describing their original meeting with the White Man in their tribal language from their viewpoint. Animal sounds and ambient noises play an important role in their oral language, transmitting both emotional and existential interpretations of their meeting with the Rondônian settlers. Hereby, the listener can try to put himself into the position of the Paiter Suruí. The 22nd of April 1500 marks the historical meeting probably with Tupi-Indians when the ships crew of Admiral Cabral first reaches Brazilian soil. The state of Rondônia, where the Paiter live, was mostly populated in the 1940ies. The dates of the encounters our text relates to remain unknown. Though the official meeting and peace treaty between the Paiter Suruí and representatives of Brazilian government took place in 1969 as result of which Paiter Suruí territories were officially demarked. Therefor it can be presumed that our quite recent events take place between the 1940s and the late 1960s. After the anthropologist Betty Mindlin, the Paiter Suruí Indians were almost eradicated by the flu by the 1980s but have managed to recuperate since then and now count a population of approx. 1200 people. From a conceptual point of view, the audio format seems in line with the tribal culture of the Paiter Suruí, whose language of the trunk of Tupi-Mondé, again, is based on oral tradition. The sound recording and reproduction sets the linguistically elaborated transcription of the mythological legend free from the text. Thereby, their story now resounds in the exhibit space in Paiter Suruí language, independently, both spatially and temporarily. As former nomads, the acoustical work can relate to the Paiter Suruí’s attitude towards material values. Besides the historical dimension, the audio format also refers to nowadays and the future. The personality of the narrator, Uraan Anderson Suruí, may stand for the challenges of his tribe. As the future Indian chief of the Paiter Suruí, through his personality and level of education, Uraan represents a today’s generation of Brazilian Indians that search for a responsible balance between the past and the preservation of their culture in regard to their clan as well as connecting to Brazilian individualistic society and claiming political participation. In summary, my acoustic work with it’s mythical content, for being in line with the oral tradition might give the Paiter Suruí as representatives of native Latin Americans a materially and medially adequate form to address their collective memories, as it might contribute to historical research and connect with Art History. 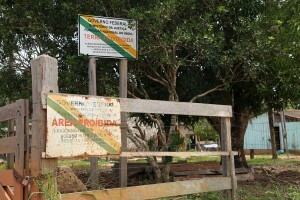 FUNAI sign prohibits entrance to Paiter Suruí’s lands, foto: Ellen Slegers, 2014. As a a European, how do you relate to this Story of the Contact with the White Man that you asked Uraan Andersson Suruí to recite? Both conceptually and personally, I feel concerned about addressing issues involving the meeting of Indians and White people, and whether a relationship can develop out of it. At first, I have curated an exhibition for the Paiter Suruí tribe, showing their traditional crafts, ceramics, baskets and necklaces in dialogue with artworks of German artists in my exhibit space estemp in São Paulo in 2013. In 2014, I have visited the Indian Reservation of the Paiter Suruí two times and have organized an exchange with two ceramicists of the Paiter Suruí in São Paulo for whom it was the first time outside of their reservation. Besides the “Legend of the Contact with White People”, I have also recorded talks with Uraan, his brother Joaton and his father Joaquim in order to emphasize on their views and to intensify our relationship. The Paiter Suruí’s way of life, indifferent towards seeking for growth and progress, is based on living together peacefully in extended, multi-generational families that can represent a different and relevant model for our problematic civilization that creates environmental damage and humanitarian suffering. In this sense, my work, the extract of the Contact with the White Man, addresses a critical view on my Western consumer-oriented lifestyle. 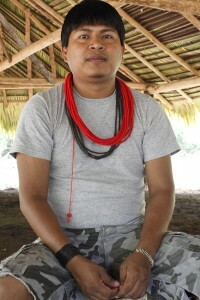 Since the original lifestyle of Indians, as of Paiter Suruí’s, is threatened by the expansion of the modern “civilization” into their living environments due to agriculture, urbanization, retaining dams, hydro-electric power plants and therefor difficult to maintain, they are in search of coherent alternatives. Also from me they hope to find suggestions and encouragement for their path. For these reasons, I find it difficult to accept that also in my name, native Indians, as the Paiter Suruí, still today as in the past are being submitted to destruction and pain and I too feel co-responsible for that. I believe this to be everyone’s concern, and so a legitime part of the questioning of „the Worlds Future’s“ at the 56. Biennial in Venice. Copyright © 2019 Ellen Slegers.